Come enjoy the sunrises and sunsets from our large deck overlooking the ocean. Have a relaxing getaway in our peaceful, quiet top floor end unit. Take advantage of our standard size pool (open mid-May - mid-September) with outdoor shower that is private for our 12-unit complex only, unlike many buildings that share a pool with several others. The private beach walkway is only steps away, so grab your chairs, umbrella and beach toys from our fully stocked gear closet and hit the beach! At night, take a leisurely stroll to the amusement park on the boardwalk and downtown Carolina Beach's great restaurants and shopping. We are a young family who lives in nearby Wilmington and loves escaping to the beach whenever we can. We love the uncrowded soft sand beaches and that Carolina Beach is so walk-able and family-friendly. Our daughter loves to play on the beach and then spend the afternoons in the pool. 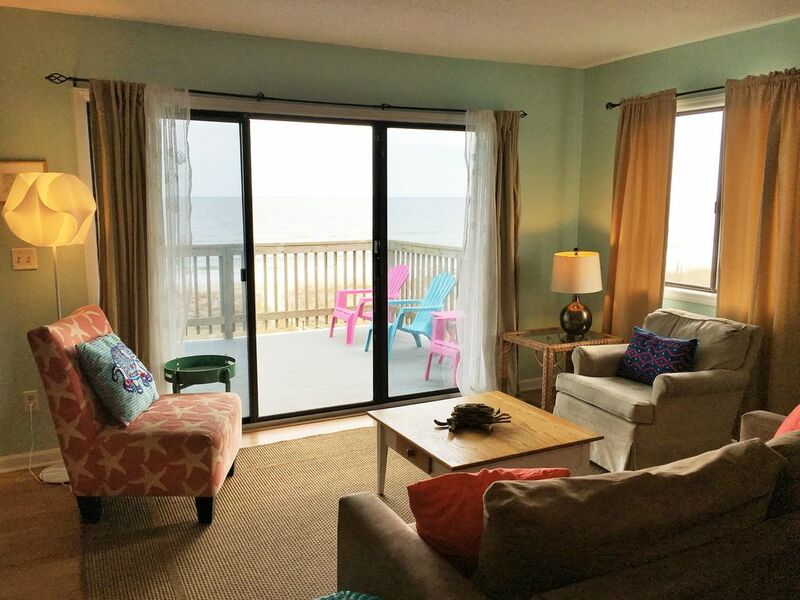 The porch is perfect for enjoying the ocean breeze in the early mornings and the evenings. We love taking long walks on the beach looking for shells and watching the sunset from the balcony. Then,we have a great time walking to dinner at the Sea Witch or Gibby's Dock & Dine followed by riding the rides and getting ice cream on the boardwalk. In the morning, don't forget Britt's Donuts! Enjoy 270 degree oceanfront views from our top floor balcony. The beach is just steps away via a private beach access. covered parking underneath the building. We now provide sheets and bath towels, hand towels, washcloths and kitchen towels. Just bring your own beach towels! The condo is a 3rd floor walkup, so anyone with mobility challenges will find it less than a relaxing getaway. Fully stocked kitchen with dishes, glasses, utensils, pots and pans, Microwave, Toaster, Coffee Maker, Private covered parking keeps cars cool. Sheets and bath towels provided. Just bring your beach towels and hit the beach! Walk to restaurants, the Carolina Beach boardwalk with games, entertainment and ice cream, fishing pier and deep sea fishing charters. Fort Fisher and NC Aquarium are on the island - a short drive away. Historic Wilmington is just 12 miles up the road, The State Park with Marina and trails are just a mile away, For the golfer, there are 5+ championship golf courses within a 10 mile radius of the condo.